Workshops educate communities across Southern Minnesota and West Central Wisconsin. This past legislative session - an August 2017 update. Pat will be part of a panel discussion on "Keeping the Farm, Nursing Home Planning and the Farm" at a Minnesota State Bar Association continuing ed event on October 13, 2017 in St. Paul. Additional panelists included JoEllen Doebbert and Bradley W. Hanson. The use of business entities in farm succession planning. Minnesota estate tax qualified farm exemption and recapture rules. How to avoid estate tax on the family farm. How property taxes can be affected by use of certain estate planning techniques. An update on the Probate Section's Outstate Study Group's efforts. Art director and graphic designer helping businesses grow to the next level with effective marketing communications. Workshops remain Pat's primary marketing tool. He holds about 40 to 50 annually. It’s not unheard of to have 20+ attendees or even more in communities across southern Minnesota from Pipestone, Slayton and Sleepy Eye to Lake City and Winona. Pat is also licensed in Wisconsin and holds workshops in Alma, Waumandee, Arcadia and other locations. On August 7, 2017 Pat had nearly thirty participants attend his workshops in Arcadia, WI. 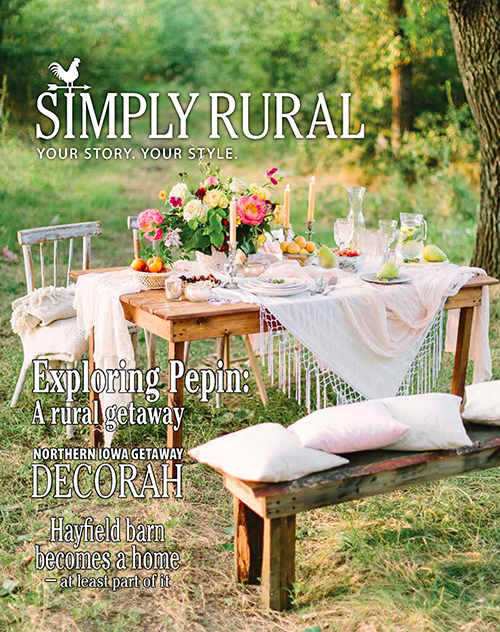 Everyone was thirsty for information about recent laws, strategies to effectively accomplish passing the farm to children without conflict, and how to deal with the daunting prospect of losing everything to a nursing home. Most of his attendees are aged 55 and over, but recently children whose parents face these issues have participated in his workshops. Good idea. To see Pat’s upcoming workshop schedule and/or register for one in your area, visit our Free Workshop page. The effort to make Minnesota’s personal exemption from estate tax the same as the federal exemption, which is 5.49M per person and 10.980M for couples failed. The federal exemption is “portable” between spouses. Unfortunately, Minnesota’s exemption is not. It is important, especially for farmers, to keep an eye on these exemptions. The Greater Minnesota Study group, of which Pat is a member, also worked a bill through the legislature to clarify what trusts can be created without going awry of the ag homestead. Regrettably, their bill did not survive the last conference session. They believe they're going to get this passed in the upcoming session. Because Minnesota has 87 counties, there is disparate treatment of this issue and it deserves cleaning up. The Greater Minnesota Study group is a cadre of out-state Minnesota attorneys who actively meet on a monthly basis and act as a forum for members to ask questions, promote legislation and otherwise try to keep up on the heady topics of Wills, Trusts, Medicaid planning, farm and business planning for outstate clients. 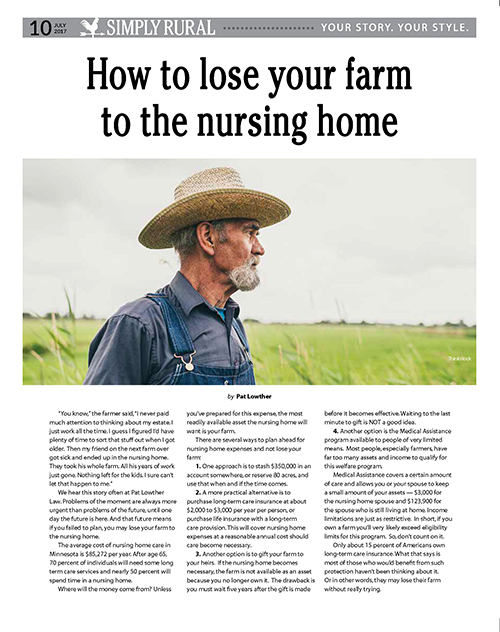 In July 2017, Pat authored a story entitled "How To Lose Your Farm To the Nursing Home Without Really Trying," which appeared in the Rochester Post-Bulliten's special magazine Simply Rural. Read an excerpt below. Read the entire story here. We hear this story often at Pat Lowther Law. Problems of the moment are always more urgent than problems of the future, until one day the future is here. And that future means if you failed to plan, you may lose your farm to the nursing home. The average cost of nursing home care in Minnesota is $85,272 per year. After age 65, 70% of individuals will need some long term care services and nearly 50% will spend time in a nursing home. Where will the money come from? Unless you’ve prepared for this expense, the most readily available asset the nursing home will want is your farm.